Copper Country Radio Amateur Association, Inc.
Dues and Donations can be made using PayPal® on the Membership page. ***The October thru April CCRAA meetings will be conducted the first Tuesday of each month at the Franklin Township Hall On Quincy Hill at 7pm. *** Hope to see you there! Meetings are open to all interested in Amateur Radio. The Houghton County ARES Net will be on Wednesdays at 9:00PM. The Ontonagon County ARES Net will be on Wednesdays about 8:30PM-8:45PM. 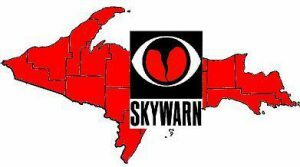 Upper Peninsula Skywarn with lots of maps, APRS weather reports, and the latest forecast for your home town! The CCRAA would like to thank Michigan Technological University for hosting the Hancock repeater. We would also like to thank Houghton County for hosting the Donken repeater. The CopperDog 150 will be March 1-3,2019. If you are interested in volunteering, would like to sign up for your favorite location, or you have a question or suggestion please contact Communications Director Bill LaBell at billlabell@copperdog150.com. We will be operating special event station K9C on popular HF bands, See QRZ.com for QSL details. The Great Bear Chase will be Saturday, March 9, 2019. Link:Great Bear Chase If you are interested in volunteering please contact Christopher Van Arsdale-KD8RAV at cdvanars@mtu.edu. At the end of Tower Rd. © 1996-2019 Copper Country Radio Amateur Association, Inc.